The reverse scuba suit is an invention made by Dr. Wernstrom used by his pet fish Cinnamon. 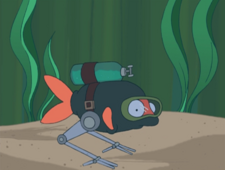 It is a suit worn by fish which allows them to breathe above water by using a bottle of water and metal legs, although it is unclear as to how the fish wearing the suit controls these legs. It won Wernstrom the Prize for Academy of Inventors in 3000 (1ACV08). The Zookeeper uses similar technology for his piranhas (4ACV04). This page was last edited on 7 April 2011, at 19:50.